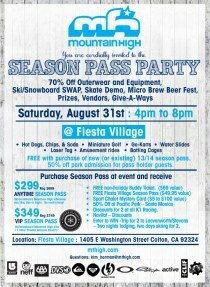 Winter will be here soon and Mountain High is celebrating with its annual Season Pass kick-off party Saturday, August 31st, at Fiesta Village in Colton. Open to everyone, the party includes free rounds of miniature golf, free Go-Kart rides, free water slides, and free laser tag missions. There are free batting cages, amusement rides, a shop skate competition, Micro Brew Beer Fest, and more. Save up to 70% on outerwear and equipment from Powder & Sun or sell your own hard goods in the Ski/snowboard Swap. All these activities plus a hot dogs, chips, and soda are FREE to new and current season pass holders, and 50% off for family and friends. Plus the person who purchases the 1,000th season pass at the party will also receive a FREE VIP Season Pass for the following 2014/15 season! For just $349 (Reg $749) Mountain High’s VIP Season Pass includes an entire season of skiing or snowboarding at Southern California’s closest winter resort plus three FREE days at 11 other partner areas. That’s 33 FREE tickets! These resorts include Crested Butte, Snowbasin Resort, Sierra-at-Tahoe, Stevens Pass, Timberline, Schweitzer, China Peak, Arizona Snowbowl, Mt Hood Skibowl, Angel Fire Resort, and Bridger Bowl. Imagine skiing some of the best powder stashes in the West for FREE with your Mountain High VIP Season Pass. Other benefits include FREE tickets to the North Pole Tubing Park, early-ups on select days, monthly discounts for family and friends, $10 Off Adult ski or snowboard lessons, 10% Off non-sale retail items, and the ability to track your days ridden and share them with friends. For those looking to save even more money, Mountain High also offers a traditional Anytime Season Pass for just $299. With this, guests can still ski or snowboard ANY day or night the resort is open during the 2013/14 season and record their statistics but there are no additional discounts or benefits. The $299 Anytime Season Pass pays for itself in less than 5 visits. Children’s passes for ages 7 to 12 are also available beginning at $199 with the purchase of an adult season pass and $219 without. Kids six and under ski FREE when accompanied by a paying adult. Mountain High’s Anytime Season Pass Sale takes place August 31st through October 31st, 2013. As an added bonus, guests who purchase by September 10th also receive a FREE Buddy Ticket worth $69.00. Passes may be purchased online http://www.mthigh.com/season-pass-sale, at the resort, and by phone at 888 754 7878. Please note there is a $10 processing for all new passes purchased. For more information or to schedule an interview, please contact Kim Hermon, Marketing Manager, at (760) 316-7830 or kim_hermon@mthigh.com.